IFTTT is a free cloud service that allows for the process known as if-this-then-that (IFTTT), connecting two apps to complete a task on one app based on the condition on the other app. IFTTT supports a repository of applets and services for Android, iOS, Google and Windows platforms. Likewise, its open API lets you create your simple apps and connect it to other apps without any coding skills. 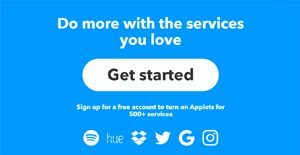 By signing up for free, you access hundreds of applets and services in IFTTT’s repository. You can choose from dozens of categories from appliances to weather and connect two apps based on a predefined task. For example, connect an iOS smart lighting device with your phone to automatically turn on the lights once you are near the house or open the garage when your BMW is on the driveway. Other tasks include backing up Facebook photos on iOS Photos and getting an alert for missing your Fitbit goals. There are varied experiences to be had with IFTTT and the outcomes are up to your imagination. Some can be useful (“tell me if it rains”), while some trivial (“tell me once the International Space Station is above my house”). For brands, IFTTT serves them a platform to synchronize their product with different apps. The BMW example above is such case. Other possible tasks with IFTTT include bookmarking, communication, blogging and education. IFTTT allows brands to connect their product with numerous third-party apps on Android, iOS, Google and Windows. This adds value to the product, while it adds engaging experience to customers. Connecting one’s product is simple and does not require coding skills, as long as the two apps are supported by IFTTT. You can also custom fit your own app in IFTTT for specific actions. Meanwhile, developers have immediate access to hundreds of services (apps) and brands including popular voice-activated assistants, bots and IoTs. You can create an applet and partner with brands. As for users, IFTTT presents them a huge repository of applets and services ranging from the important to the trivial. From weather to education, social media posts to health alerts, the applets and services run the gamut of apps and smart devices that can be linked. For example, an applet can tell Alexa to call a device with the IFTTT installed. Another case is to save iOS contacts to your Google contacts. If you are interested in IFTTT it might also be a good idea to investigate other subcategories of Best Social Media Management Software collected in our database of B2B software reviews. There are trendy and widely used applications in each software category. But are they automatically the best fit for your company’s special needs? A market-leading software product may have thousands of users, but does it provide what you need? For this reason, do not blindly spend on popular systems. Read at least a few IFTTT reviews and mull over the elements that you wish to have in the software such as the fees, main features, available integrations etc. Then, shortlist a few apps that fit your requirements. Check out the free trials of these apps, read online comments, get clarifications from the seller, and do your research meticulously. This exhaustive groundwork is certain to aid you select the finest software solution for your organization’s unique wants. We realize that when you make a decision to buy Social Media Management Software it’s important not only to see how experts evaluate it in their reviews, but also to find out if the real people and companies that buy it are actually satisfied with the product. That’s why we’ve created our behavior-based Customer Satisfaction Algorithm™ that gathers customer reviews, comments and IFTTT reviews across a wide range of social media sites. The data is then presented in an easy to digest form showing how many people had positive and negative experience with IFTTT. With that information at hand you should be equipped to make an informed buying decision that you won’t regret. What are IFTTT pricing details? What integrations are available for IFTTT? If you need more information about IFTTT or you simply have a question let us know what you need and we’ll forward your request directly to the vendor.